Here’s a couple of the projects that we’ve been working on in May over at bunted! HQ. made for a special little Finnish girl! I adore the Regency Floral fabric, definitely one of my favourites. Makes me come all over a bit Jane Austen-y, desirous of cakes and tea and good company. An absolute dream to work with too! 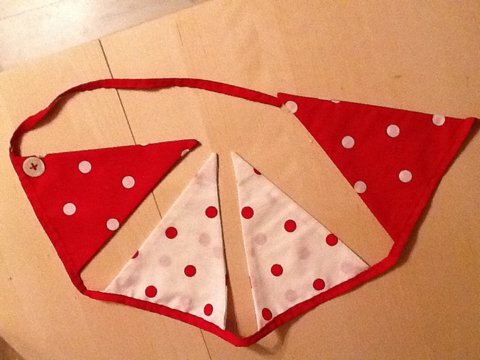 Polka dot bunting made out of a duvet cover! I think this is great. This was a Sarah project, and she magicked 4.5 metres of bunting out of left over fabric from a duvet cover that she made a hanging tent out of! Honestly! She must have been wearing creative pants. We’re now putting the finishing touches on some lovely uber-girly bunting for one little miss, and the straight on to some Christening bunting for twins! Holy sheesh kebab! Summer is on her way peeps, she called me just yesterday and told me that herself. We all know that nothing makes her happier that a good dose of bunting. So get to it!! The Regency bunting is lovely!